Cheetham Park, more commonly known as Elizabeth Street Park is a Victorian park, which is situated at the centre of Cheetham Hill, North Manchester. Opened in 1886, the park holds happy memories for many people who grew up in the area. However, over recent years it has been neglected and is currently not well-used. 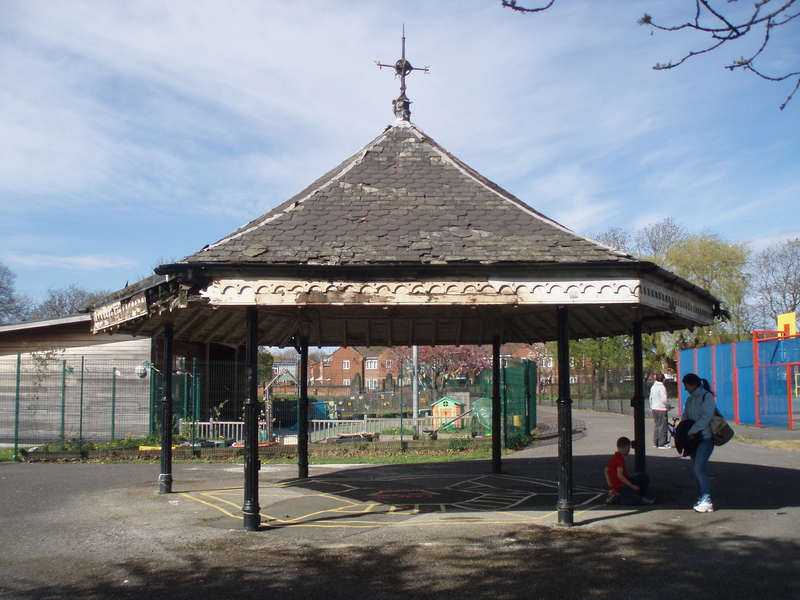 The park is also home to two historic structures – a listed bandstand which dates from 1890, and a viewing shelter, which sits opposite and references the bandstand’s architecture. In 2013, arts organisation Buddleia worked with residents of Cheetham Hill, North Manchester, and artist Torange Khonsari, of art and architecture group Public Works, to explore the history of Cheetham Park on Elizabeth street and to think about how it could once again become an important community space.We invited people to take part in a series of activities in the park. These included the DIY Common, developed by Torange Khonsari as a way to use the park as a collective resource for the surrounding community. That project was sponsored by Buddleia, the Arts Council, The Heritage Lottery Fund, and Zest North Manchester. A new artist residency on the theme of Cheetham Park has started as from February 2015, funded by the Leverhulme Trust and led by Torange Khonsari in partnership with the Manchester Jewish Museum, Dr. Abigail Gilmore from the Institute for Cultural Practices, and two Researchers-in-Residence from the University of Manchester. Torange Khonsari is an artist and academic based at the Royal College of Art. She will be working at the museum over the next 7 months on a fascinating project about Cheetham Park (on Elizabeth Street). Her residency will explore the history of the park, collecting people’s memories and holding activities both in the park and at the museum. She now wants to speak to anyone that remembers the park.The park was once the social hub for residents of Cheetham Hill with attractions including a bowling green, tennis courts and a bandstand. MJM holds the minute books from the Cheetham Park bowling club (comprising mainly Jewish members) and has photographs in its archive documenting the park’s history. Today the park is now in serious decline with a derelict bandstand and overgrown flower beds. Using MJM’s archives, Torange now wants to safeguard the park’s future by celebrating its past. Torange is now keen to speak to anyone that has memories about the park. She also wants to speak to anyone that wants to join the craft workshops that aim to bring life back to the park. Were you, or any of your family, members of the Cheetham Park bowling club? Did you play tennis in the park or do you remember the band playing on the bandstand? Perhaps you just played in the park as a child? Whatever your memory, Torange would like to hear from you.